Happily we have many horses in the village today but not as many as we had in the past! My grandfather said that in his youth (about a hundred years ago) that there were usually about fifty horses in the village and they were mainly working types. I also remember him saying that at that time, life moved at about seven miles an hour, the pace of a horse. Modern tractors are still rated by their horsepower and it has always intrigued me that at that time the village could be farmed with fifty horsepower, when today the combined horsepower of the tractors that do the work must run into thousands. 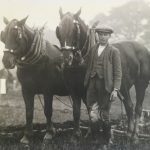 By “working types” I think he meant the heavy horses that did the farm work, like the pair pictured with Frank Morton at Thorpe Green in 1940 (this was two-horse land). Sadly this picture has a tragic element in that Frank, by then living at Cockfield was killed in the Second World War. 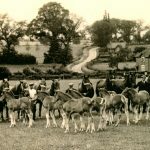 One of the joys of the working horses was that they were self perpetuating and pictured are mares with their foals opposite New Cottages in about 1940. With them are horsemen Ernie Shipp, Arthur Lister and Tom Ruffles. 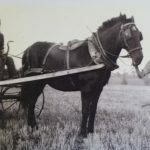 Ernie was my aforementioned grandfather and he was greatly saddened by the demise of the working horse just a few years later. He carried on working on the farm but never took to mechanised farming, like many of his generation. In the background of the picture, notice how narrow the road was then, this is also a feature on many of our other archive photos. Not all working horses in the village were heavy types. The horse with the precarious looking straw rake was called Julius and is pictured with Norman and Betty Squirrell at Hill farm in 1946. Julius was a multi tasking horse used for lighter fieldwork but he also did a lot of road work with a trap and they rode him as well.